Ask anyone who has visited Disney World, and probably even most people who haven’t, what the heart of Magic Kingdom is, and they’ll probably tell you Cinderella Castle. This beautiful castle is much more than a home to one of Disney’s most beloved princesses. There are so many little details that go into making this amazing building what it is, and if you’re a Disney buff like me, you might want to know some of these interesting secrets. 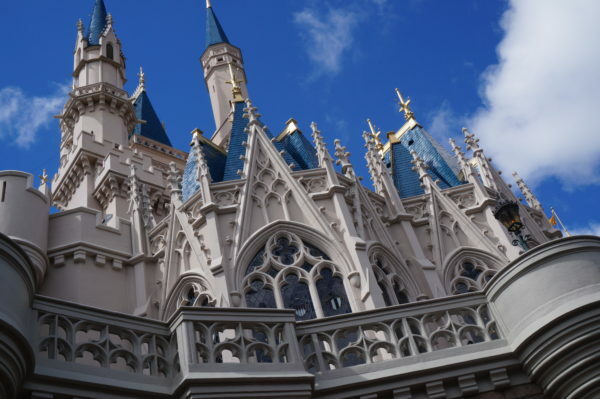 Let’s take a look at the top ten things to know about Cinderella Castle. 1. There’s a lot to do inside. Cinderella Castle is huge, and guests don’t have access to most of it, but there is a lot that they can do inside. Bibbidi Bobbidi Boutique is a salon for young Disney princesses and even princes who want to transform into their favorite fairytale character. 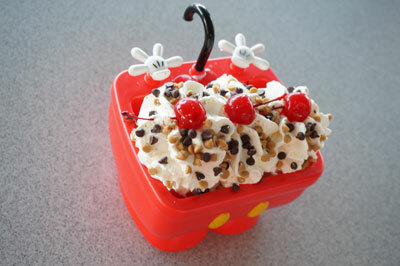 This is a popular experience to do just before dining at Cinderella’s Royal Table, which is inside on the second floor. The restaurant serves breakfast, lunch, and dinner, and it’s one of the most popular restaurants on property. Be sure to make your Advanced Dining Reservations early! 2. There are some fun details. Disney Imagineers like to hide “Easter Eggs” in their designs, and Cinderella Castle is no different. If you have ADRs for the restaurant, you’ll have to wait in line to meet Cinderella before you’re escorted to your table. 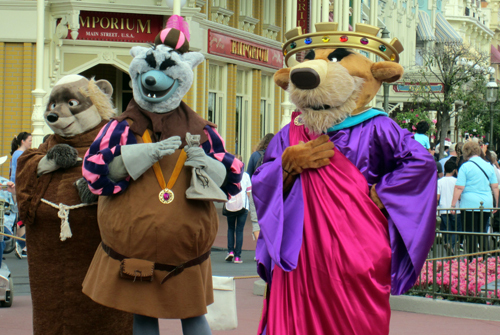 In the Grand Hall, look for Jaq and Gus Gus, Cinderella’s trusty companions, hiding on the upper wall. 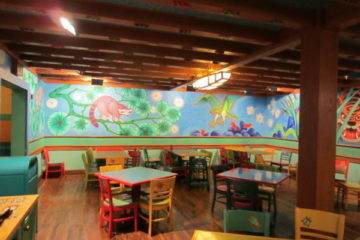 Inside the restaurant, look up and you’ll notice decorative flags around the ceiling. These flags and coats of arms honor some of the most important people who helped create Disney World and Cinderella Castle like Marc Davis, John Hench, and Marty Sklar, all Disney Imagineers. There are also flags for members of the Disney family. Outside between Tomorrowland and the castle, there’s a beautiful wishing well telling the story of Cinderella’s bird and mice friends making a dress for Cinderella to wear to the ball. Lucifer, the cat, is sneaking around the bottom trying to disrupt their plan. If you’re in the area, stop by and make a wish. The change is collected regularly and donated to children’s charities. 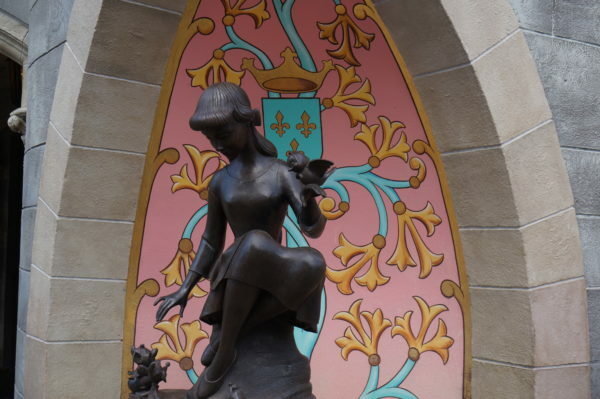 There are some fun details around Cinderella Castle. 3. It’s a great place to propose. There are several ways and places to propose in Disney World, but Cinderella Castle is probably the most popular. You can do a simple proposal somewhere at the base of the castle; just be sure to have a friend or family member nearby with a camera to record the special moment. You can also propose inside the castle at Cinderella’s Royal Table. This is a little bit more involved and takes some more planning because you have to make ADRs and arrangements with the Cast Members who can arrange for the ring to be delivered to your table in a glass slipper with roses or with dessert. They can even have a photographer ready to capture it on film. Imagine proposing or getting married in front of Cinderella Castle! 4. It’s a great place to get married too. If you proposed in Magic Kingdom, why not bring your engagement full circle and get married there too? Disney’s Fairy Tale weddings and Honeymoons offers weddings in front of Cinderella Castle. Your pictures will be incredible! After the wedding, ride off into the future down Main Street USA in Cinderella’s carriage with her horses and footmen. 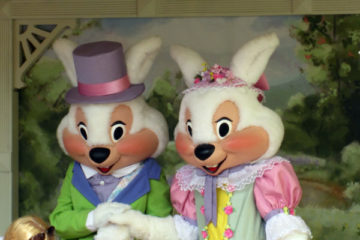 Weddings can be held before the park opens for the day. 5. Young royalty can get quality treatment too. You don’t have to be of marrying age to be treated like royalty. If you’re celebrating a special occasion, you can arrange for a Cast Member to deliver a special gift to your little prince or princess on a tufted pillow. 6. You can drink inside. For many years, the Magic Kingdom was mostly a dry park. This was important to Walt because he wanted his park to be family-oriented and alcohol did not play a role in that. 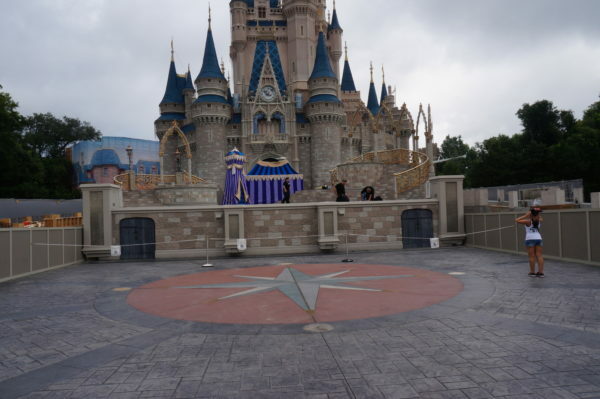 However, select Disney World restaurants, including Cinderella’s Royal Table, have started serving alcoholic beverages. Lunch and dinner menus now include sparkling wine and champagne. Cinderella Castle is beautiful at night! 7. It’s a great place to watch fireworks. 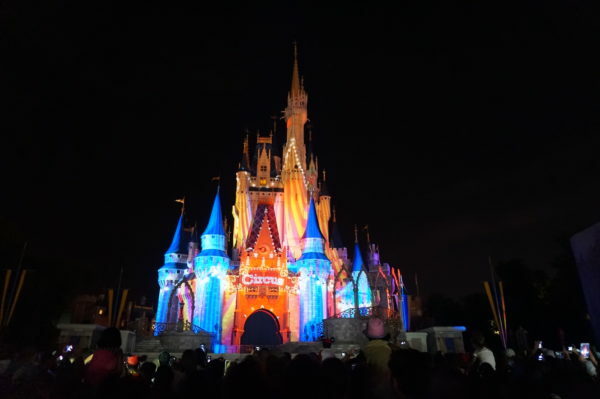 Cinderella Castle is the center of excitement when it comes to the nighttime spectaculars in the Magic Kingdom. From the outside, the castle is the backdrop for an amazing projection show that almost makes the castle disappear in the image. Fireworks shoot from all around to make for an event that is incredibly aesthetically pleasing. You can also see Tinkerbell fly through the air at the end of the show. It takes a little more than pixie dust to get her; someone pushes her quite hard out of the window so she has enough momentum to make it the whole way across the hub. If you happen to have ADRs at Cinderella’s Royal Table during the fireworks, you’ll have one of the most unique views of the fireworks in all the Kingdom. Cinderella Castle is the second tallest structure in Walt Disney World. Only the Twilight Zone Tower of Terror, at 199 feet tall, is taller. The castle stands 189 feet tall, but it looks much taller than that with forced perspective. Cinderella Castle stands just under 200 feet, so the turrets don’t have to have flags at the top to warn planes. A common myth is that the turrets can be removed during strong winds, which Florida can face during hurricane season, but this isn’t true. The castle can, in fact, sustain winds up to 125 miles per hour, which is at the higher end of a Category 5 storm. 9. There’s an awesome suite inside. Did you know that a few luck guests and VIPs can actually stay inside Cinderella Castle? It’s true. There is a magical suite inside the castle complete with beautiful stained glass windows, gilded furnishings, and hidden flat-screen TVs behind a mirror in the den and a painting of Cinderella in the bedroom. The bathroom is perhaps the most magical though; you can relax after a long day in the park in a Jacuzzi bathtub set under a fiber optic night sky. Don’t lose track of time, though. It’s easy to do since the grandfather clock is permanently set to 11:59. If you’re ready to open you wallet, not so fast. 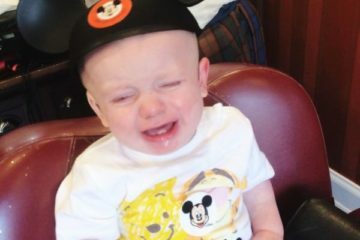 The suite is only offered to contest winners or as a special gift from Disney and cannot be booked for money. It’s been used for giveaways on special occasions and for Make a Wish patients. 10. It’s not just a fairy-tale. Cinderella Castle in Magic Kingdom may be based on Disney’s famous movie, but the building of the castle was actually inspired by real life castles like Fontainebleau and Versailles. It also features architecture inspired by the homes of French nobility. Does seeing Cinderella Castle get you choked up? 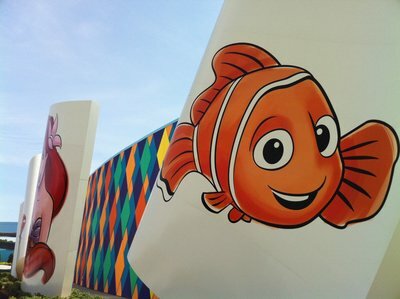 Is Disney Not Investing Enough In Disney World?